Let me first recount the status of my battery system as detailed in a post from September of this year. Thus far, I have used Trojan T-1275 batteries in my PV system—each 12 V, each rated at 150 Ah (yielding an energy storage of 1.8 kWh: just multiply voltage by charge capacity). Empirically, I found that my batteries have always behaved as if their capacity was 125 Ah, from day one. During the first few years of my growing PV system, I operated with two batteries, labeled A and B. I worked them pretty hard, and they gave up around the beginning of 2010. I replaced them with two fresh batteries on 2010-02-15 (batteries C and D), and added two more in parallel a few weeks later on 2010-03-04 (E and F). Batteries C and D at top, E and F lower. C and D are in series to make 24 V, as are E and F. These two chains are wired in parallel to each other. Looking somewhat different (E/F are T-1275+), the internal construction of all four batteries is identical. Studying the discharge curves for every night, I found that the batteries had settled into a very stable performance, actually improving in years two and three from year one. Metrics (explained elsewhere) illustrating the settling in of the batteries in my PV system. This is also seen in the load-corrected state-of-charge plot vs. voltage, where recent performance edged closer to matching the battery specifications—after adjusting for the realized capacity. Comparing best-fit performance (lines) to the manufacturer’s values (dots), it appeared that the batteries were doing better with time (more here). At this point, I have sourced 1686 kWh from my four batteries in 30 months, or 422 kWh each. 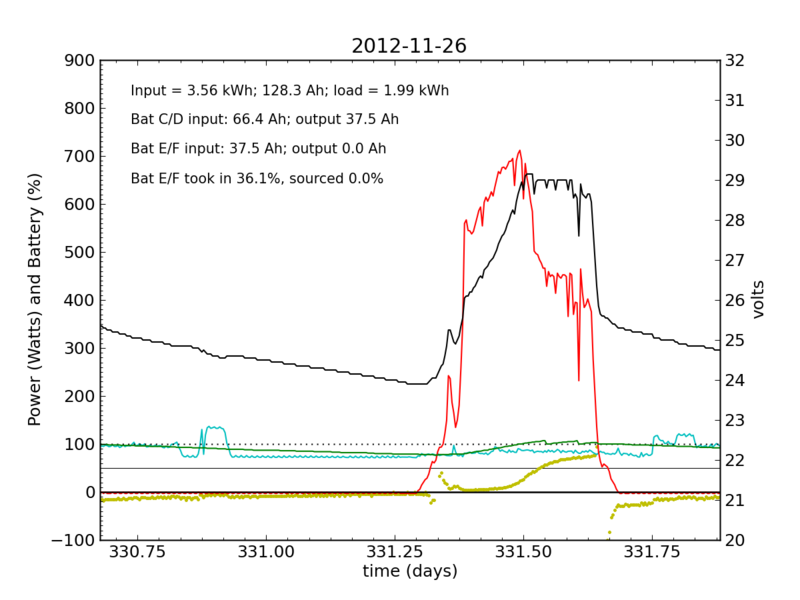 At a de-rated 1.5 kWh per battery, I have gone through 281 full-depth equivalent cycles. In about 915 days, this means my average cycle depth is 31% and I might expect 2000 such cycles (5.5 years; 620 full-depth equivalent cycles) at this level. So judging by this, I’m almost halfway done. Oh that it were true. Every day, an automated script grabs data off of my solar recording apparatus, and most nights I check the day’s performance. 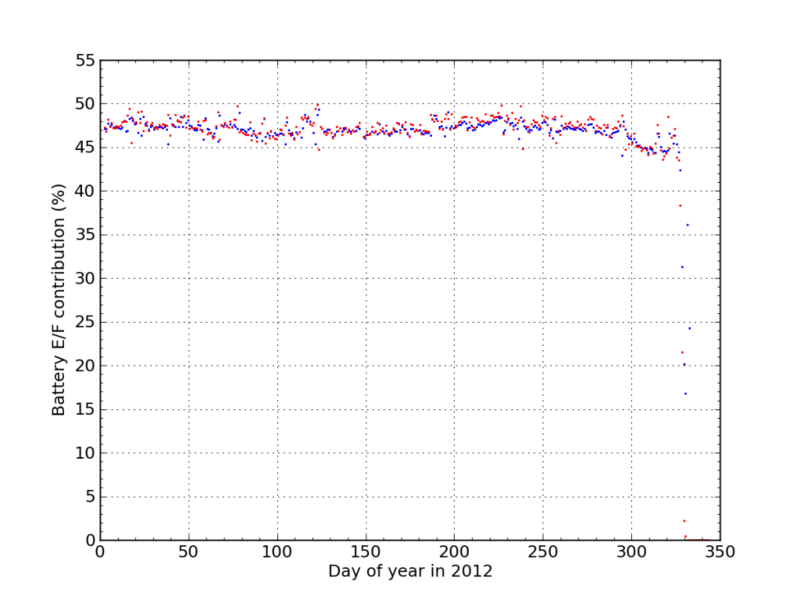 Below is a typical plot of the five-minute resolution data. 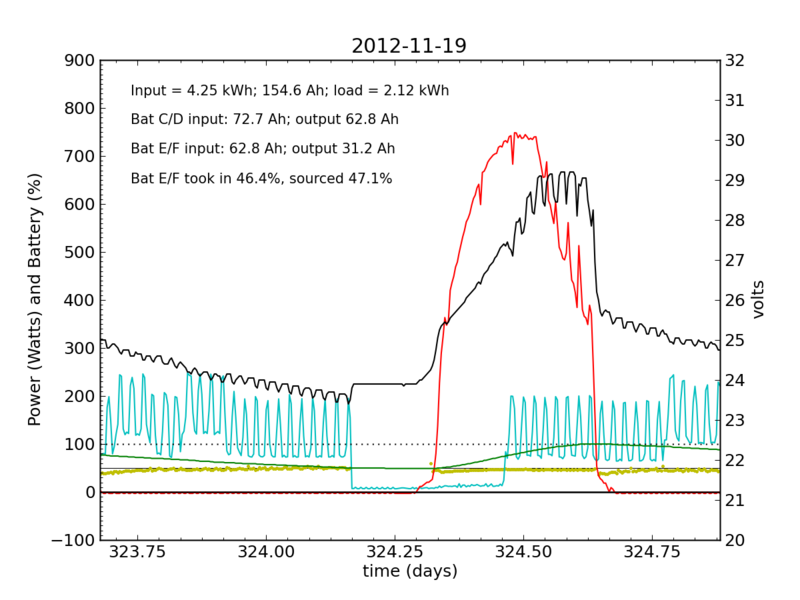 The post on PV efficiency details the curves, but in brief: red is solar input; cyan is the load (refrigerator cycle spikes evident), black is battery voltage (right-hand scale), green is battery state of charge (percent full), and the yellow dots indicate what fraction of battery current is flowing to battery chain E/F. The reference line at 50% is a useful gauge. Ideally, battery chains C/D and E/F would contribute equally to sourcing or sinking current, and the dots would always be at 50%. Minor ticks on the horizontal axis are at one-hour intervals, so it’s fairly straightforward to read the time (0.25 days is 06:00, etc.). We see here that during the day, when the batteries are charging, the two chains receive nearly identical current (and therefore similar power, since their voltage is guaranteed to be the same by the magic of connective copper). 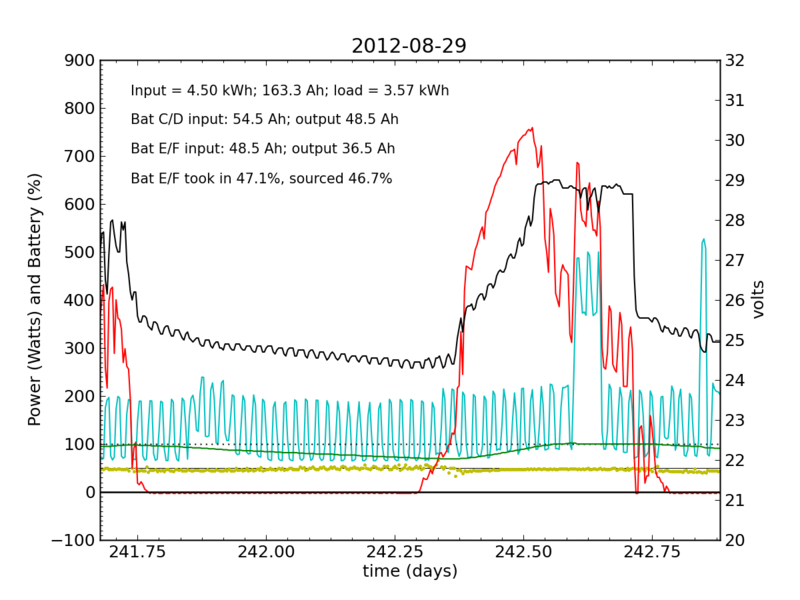 In the evening, Battery E/F doesn’t contribute quite as much as C/D, but after midnight, it reaches parity, and even wiggles around depending on load variations due to the refrigerator. I am accustomed to seeing Battery E/F slightly under-perform, but not by a large margin. Notice also the gentle slope of battery voltage decline during the night. 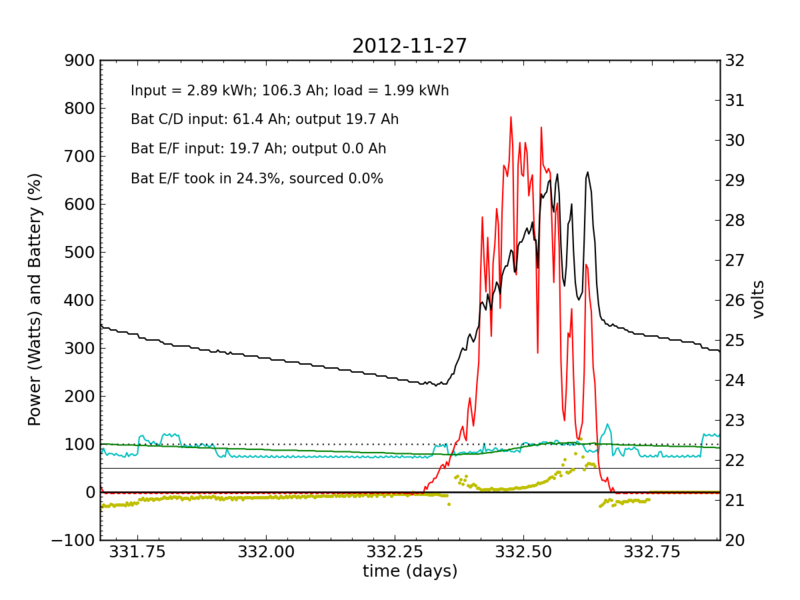 November 18 was a partly cloudy day, as seen by the spiky nature in the red (solar input) curve. The battery did not get fully charged, but we see the typical dance of the yellow dots; just shy of 50% for the most part. November 19 was a sunny day, but the previous day’s deficit caught up to the (undersized) battery bank, causing the inverter to switch to utility input at about 04:00. During times when the current into or out of the battery is small, I do not plot the yellow dots, because they can become meaninglessly scattered when comparisons between small numbers are made. Otherwise the battery looks pretty normal: no alarms. Tuesday, November 20 is a picture-perfect example of what I like the PV system to look like. Sunny weather, plenty of time spent in absorb state (battery voltage plateau, while solar utilization scales back to accommodate), loads cranking away doing their thing, and the yellow dots behaving reasonably. Aside from the fact that the system is requiring 200 W to maintain absorb state at the end of the cycle, things look great (absorb state took just 130 W on 2012-08-29). On Wednesday, after weather in New Mexico blocked our attempt to shoot a laser at the Lunar Reconnaissance Orbiter, I did scramble out of town for a weekend in the mountains. No internet. I had no way to check on the system’s performance on Wednesday. But little worry on my part. I’ve left the system essentially unattended for months while away (though checking remotely), and nothing went off the rails. I had no reason to expect anything different. 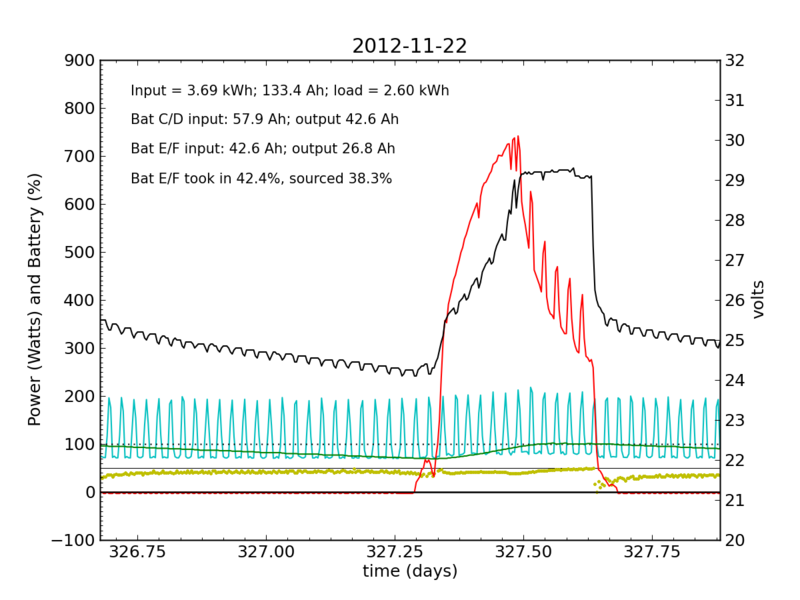 Undetected by me, the system started showing a problem on Wednesday, November 21, when Battery E/F was only sourcing 25% of the power immediately after sunset. It also did not quite reach up to 50% in the afternoon, as it normally does. Would I have caught this problem in my often hasty scan? Who knows. I didn’t get to try. Thanksgiving Day, while we fussed over cooking a 12 pound turkey in a small charcoal grill, the PV system started showing serious signs of trouble. In a 24-hour average, Battery E/F only took in 42% of the input power, and sourced only 38%, dipping alarmingly near zero just after sunset. Over the following night and day, things went seriously ill. Around 02:00, Battery E/F began to shirk its share of running the house. It decided that 10% was enough. The battery voltage turned downward as Battery C/D stepped up to fill the gap. 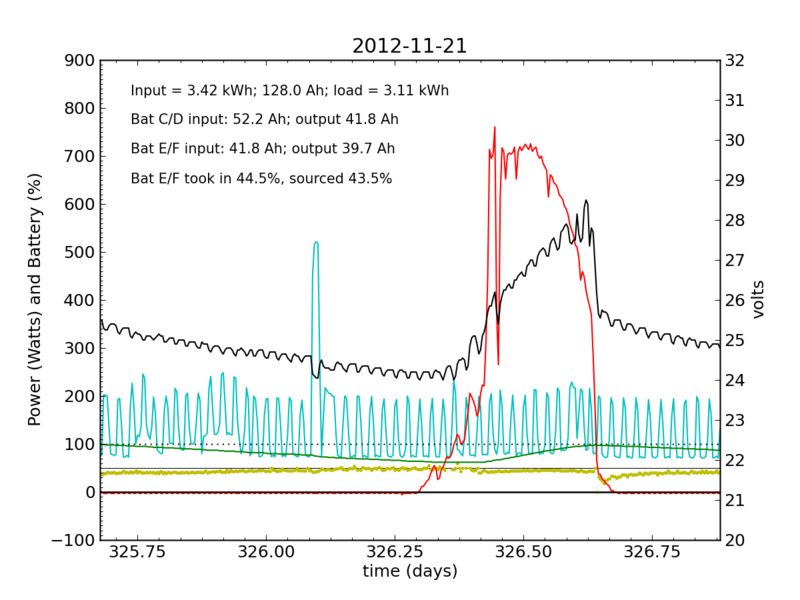 During most of the ensuing day (Friday, Nov. 23), Battery E/F accepted far less than its fair share of charge. Over a 24-hour period, it only accepted 31% of the total charge (about half as much as did Battery C/D), and only contributed 22% to driving loads. The failed battery proved itself to be practically useless the following night, and only really started accepting appreciable charge once Battery C/D reached its absorb potential and began refusing current. This time, after sunset, we see a net transfer of energy from battery C/D into battery E/F (yellow points in negative territory). Bad battery! It was at the end of this Saturday that I returned home and checked the system. Imagine my surprise, remembering the performance from 2012-11-20 and suddenly seeing the plot above with an obviously defunct battery! It only contributed 2.2% of the outbound juice in the 24-hour period from 21:00 to 21:00. Be advised that now the green line (percent full) has lost meaning, as the capacity is no longer that of two fully-functional battery chains in parallel, but effectively only half that. 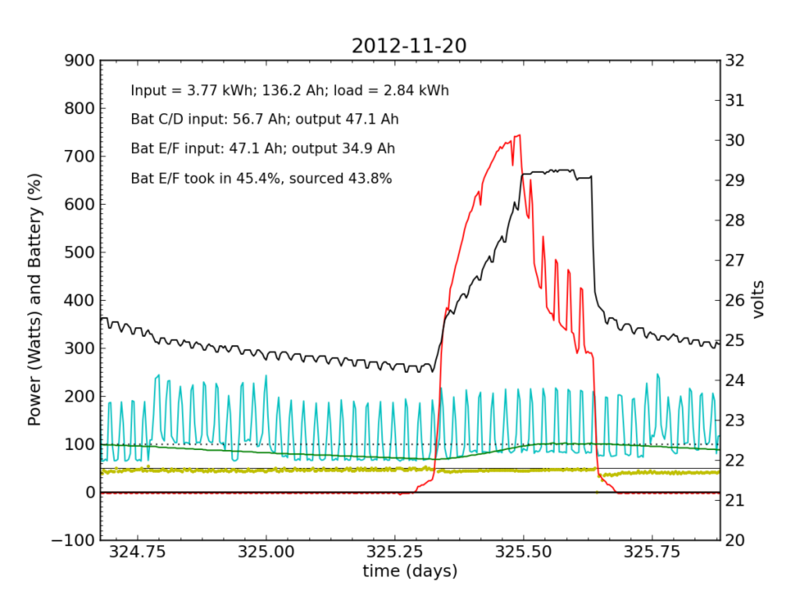 Around 01:00 on Nov. 25, the steeply declining battery voltage had fallen far enough to trigger the inverter’s switch to utility input. Battery E/F was effectively a drain all night. The following day (Sunday, the 25th), some charge managed to get dumped into Battery E/F, but not much. It was now dead weight, contributing nothing while sucking up available energy. 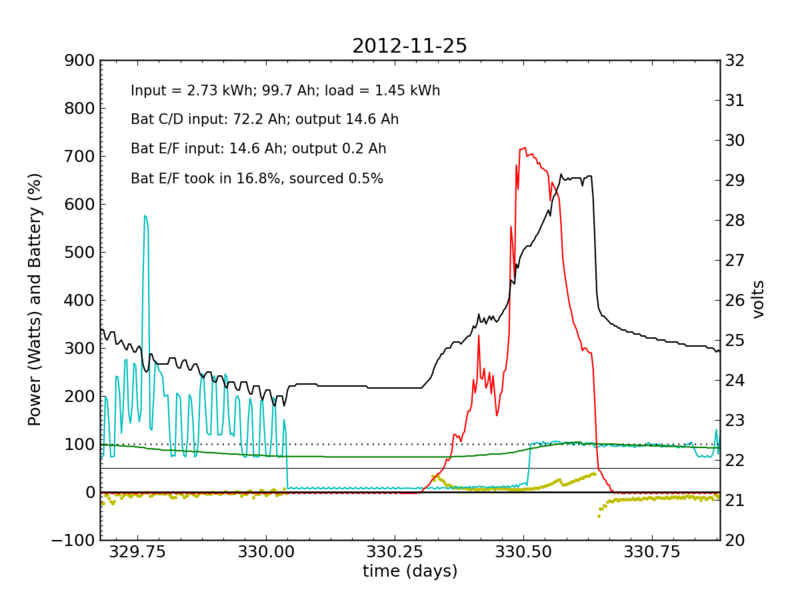 At noon, the inverter switched back over solar/battery. That morning, I had accepted the fact that the system was seriously impaired, and disconnected the refrigerator from the PV circuit, plugging it into the utility outlet for the first time in years. So sad. The result is smoother load plots from this point forward, while my TED plots are much messier than usual on account of the change. We see a net E/F drain again at night. I did not have much time to characterize the problem that day, playing catch up on work from spending a few days away, and also having to write a blog post from scratch. Without the fridge load, Battery E/F took in a bit more juice (thanks to longer absorb cycle), but at this point is still a net drain at night. That evening I measured batteries C through F to be 12.33, 12.39, 11.12, and 13.59 V, respectively (both chains must add to the same voltage). So it’s Battery E that is the problem. Battery F is super-charged (and oozing a bit of electrolyte). I worked from home the on the 27th and made occasional checks of battery voltages, to learn what I could about the dynamic charge state. At 07:45, I measured (11.91, 12.00, 10.79, 13.12) for the four batteries. At 11:40 (during a cloud passage, unfortunately), I measured (13.31, 13.37, 12.12, 14.71). Okay, so Battery F is roughly at an absorb voltage, still shy of the 15.5 V equalization voltage. So I’m not absolutely toasting it. Tired of having the dead battery act as an energy drain on the system, I finally pulled the plug on Battery E/F, disconnecting it from C/D around 18:00. Just before disconnecting, E and F measured 11.29 and 13.81 V, propped up by batteries C and D (drawing power out of the good batteries). After disconnecting, they relaxed to 11.15 and 13.5, slowly creeping down. As of this writing, on 2012-12-09, the batteries have settled to 10.49 and 12.63 V.
Testing the cells with a hydrometer, it is not hard to identify the weak cell, which has an off-scale-low specific density (below 1.10). For a sense of the numbers/variation, the table below lists measured values. If I plot the fraction of juice accepted (blue) and sourced (red) from Battery E/F during 2012, We see the dramatic endgame. 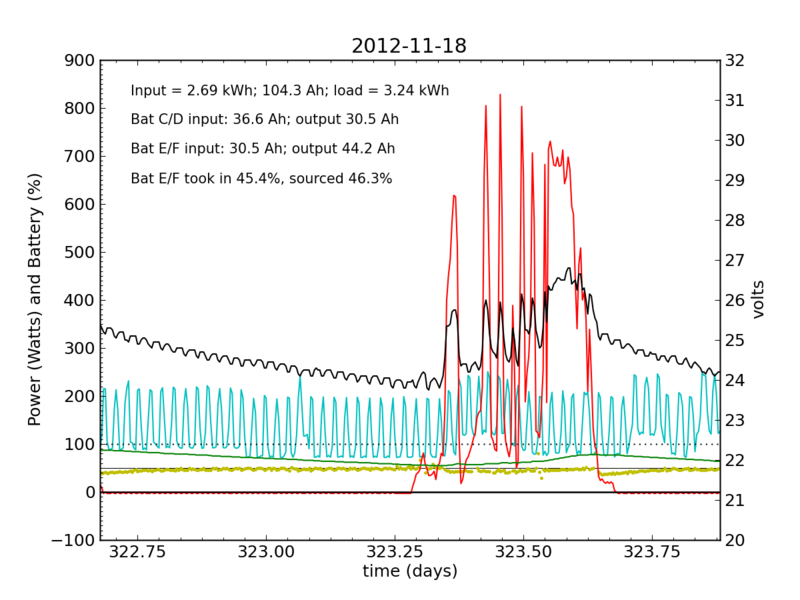 I think this plot nicely illustrates the degree to which the battery failure caught me off guard. Aside from the “while you were away” twist, the failure was really fast. There were no instances outside the 45–50% window the whole year, and then bam. Okay, so I have a bad cell in a battery. Maybe the situation is salvageable. Perhaps a “battery doctor” could bring the battery back to an operable state. I’ve seen prescriptions online for how to recover some functionality from a bad cell. You can’t expect original performance, I gather. But perhaps it is possible to turn an otherwise heavy block of junk into a useful battery again. Let me say up front that I am not a battery expert. I may be carrying misconceptions that need to be cleared up. Please correct me if I have things messed up. It’s a safe bet that when I get through this failure episode, I’ll know more than I do now. Whether or not battery repair is possible/effective, I judge it to be a near certainty that the revived battery would be poorly matched to its brethren. We have, in my 2×2 arrangement, a series problem and a parallel problem. In series, when one battery is in worse condition than its partner, it will sit at a lower voltage in both charging and discharging scenarios. It would seem, then, that the partner in better health gets a higher absorb state (or equalization) voltage, which has the effect of keeping that battery in relatively better condition than its lesser companion. So there is a self-reinforcement going on that I imagine will ultimately go unstable, producing another cliff-edge. Perhaps this is also why single cells in a battery (stacked in series) drive off the cliff. The parallel problem is that if one chain is weaker than the other chain, a similar phenomenon happens. The “good” chain gets higher current during charging, better conditioning that chain while in absorb state. And then we have the power swap issue after sunset, where the weaker battery drains energy from the better battery until the two are at a similar charge state. I am not, therefore, convinced that I want to try and revive the defective battery, almost certainly leaving me with a mismatched condition. So what’s the conundrum? Just buy a new battery! Secondly, even biting the bullet and buying two new batteries will leave me with a parallel mismatch and attendant problems. So it seems like a really bum deal! Must I replace all batteries at once? I suspect that I am missing something here, and that a new battery in an otherwise old set may work itself out in some non-destructive way. I am still adapting to my reduced-capacity PV reality, and meanwhile needed a bloggable topic that I could cover quickly, even if the saga is incomplete. I still need to do some research, and perhaps comments will help set things straight. Note to readers: I will be taking a holiday break in my normal two-week cadence, so that I plan to be back on Jan. 8. 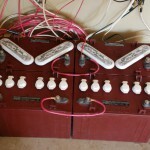 This entry was posted in Energy Storage, Personal Energy and tagged batteries, home-solutions, photovoltaics by tmurphy. Bookmark the permalink. So you had two problems. One is parallel connections and other that your controller or inverter doesn’t do equalization charge. My controller does equalization. And I do it routinely. I activate it manually when conditions are favorable, and I’ll be at hand to top off the cells with distilled water. Frankly, it’s a miracle that lithium-ion batteries as we know them scaled as well as they did. A cobalt-oxide sandwich and a bunch of graphitic carbon acting as electrodes for lithium? Electrolytes that only survive because their breakdown product is a stable protective layer? That is not an elegant piece of materials engineering, it’s a flammable poison-and-chicken-wire contraption held together with duct tape. I’d differ with the physicist quoted in your last post. The problem isn’t to be solved by understanding the physics of charge-discharge process. The problem will be solved by exploring the chemical space available. I’d be curious to see an update to your earlier post about how awesome PV is as a solution, adjusting battery replacement cost to be aligned with your actual experience (whether typical or not). I still think that as renewables go, solar is the most awesome. I would not be able to make any of the alternatives work for me at home. And compared to century-scale challenges like fusion, it’s outstandingly easy. My panels and electronics are troopers and demand little to no attention on my part. It comes down to storage. The batteries are the pain. And storage could represent a serious bottleneck for large-scale solar, which would be unfortunate for us all. They are 16-18% efficient when the sun is hitting them, and hopefully you receive 5-4 hours of sun. Gas engines are almost twice as efficient: 25-30%. Coal plants are 40% efficient. So you are using an inefficient energy (coal) to make some thing even more inefficient (solar cell). We would be better off consuming less, than trying to find a free lunch. There are some pretty large misconceptions here about solar. A panel is a net energy producer in its lifetime, not a drain of coal resources. With an energy payback time of 3-4 years and a lifetime of 30-40 years, you’re looking at a 10:1 gain (energy returned on energy invested, or EROEI). Also, see my post about not being a PV efficiency snob. 15% is actually remarkably food, beating biology (photosynthesis) by a large margin. Should we shun food because it was only 1% efficient at collecting solar energy? Unless you have too little roof space, efficiency of PV is a non-issue. Really. There is a practical form of intertial confinement fusion that could be built today that requires no additional engineering or physics breakthroughs and produces net energy. It is not necessary to wait ~50 years for commercial tokamaks or Laser Fusion power plants to become commercial reality. Inertial Confinement Fusion reactors that use a tiny amount of fissile U-233 to reliably create the conditions for Deuterium-Deuterium (D-D) fusion can be built today. The nuclear waste produced from Deuterium-Deuterium fusion is ultimately just non-radioactive helium (D-D fusion also produces Tritium which is a fusion fuel that is relatively short half-life [12.32 years] and is moderately radioactive. A D-D fusion reactor can burn in place the Tritium it generates, producing additional energy via a D-T fusion reaction, and end up only producing non-radioactive helium, and a tiny stream of Thorium fission products as its nuclear waste). This system is called PACER, and the LLNL version of this fusion power plant was designed by Dr. Ralph Moir, who was the senior nuclear designer at the Lawrence Livermore National Laboratory during the years of my career service. (I am not a nuclear designer or fusion scientist but only a LLNL Field Test Division “grunt” who assisted a large and very skillful scientific-engineering team in testing the devices in the US nuclear arsenal to ensure safety and reliability). Tom, if you figure out what happened to the cell, let us know! The chemistry isn’t that sophisticated and I’m curious to know if it was a material or construction issue. It’s interesting to imagine the “sufficiently smart” charger that would take that battery out of service and send you a tweet demanding your attention. Why should it be your problem to disconnect the battery? We have MOSFETs and relays to handle that for us. That said, I did spend some time once looking at the charge-a-battery-on-a-bicycle problem, and decided not to even try. Getting the charge right with intermittent and variable input power and variable temperature made it just too hairy. 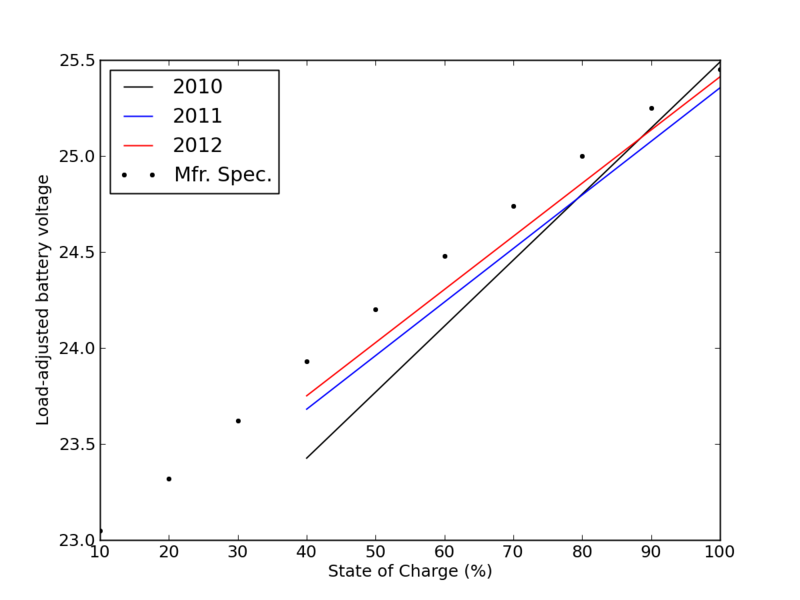 The two candidate designs were (1) a Lithium-ish (one of that familiar) kept well below 100% charge and (2) a trickle-tolerant NiMH, trickled at roughly 2:1 charge:discharge. A really tight design (100% charge and/or no energy wasted on trickle charging) was not in the cards for me. the 2 or 6 volt batteries Trojan says are optimized for renewable energy. Still, topping off and equalization the pack sounds like a long term commitment. I think your article makes a good case for grid tied PV. You could take your battery money and buy PV panels. Love your “Do The Math” blog. Best guess: shorted cell, essentially mechanical failure. Aside from “de-tuning” a new battery by diluting the electrolyte, so that it matches the old one it will be in series with (just a speculative thought), dropping in a new one and accepting the imbalance seems like the least wasteful option, and your reliable equalizations should prevent any major imbalance from getting out of control. Next time, AGM might be a better investment, or else some really extremely heavy duty, big, long service flooded units. We have usually installed Davidson here in BC, they last over 10 years and seem to never fail like what you have seen, which I cannot say for any smaller/cheaper units like what you used. You’ve been able to measure each cell, and identify that only one is failing. Would it be possible to replace only that cell with one from a new battery in order to have less of a mismatch than with a completely new battery ? Maybe then check the capacity of A, B, E’, and F to see if another option is a better match than A+B and E’+F (would be either A+E’/B+F or A+F/B+E’). From an electronic point of view, I’m starting to think that having to match the voltage in parallel is simply bad for your batteries and the ideal would be to find a way to use them as current sources, and not voltage sources. Of course the classical solution of using a resistance wastes power. Don’t forget however that you *are* already using the internal resistance to compensate the mismatch and it’s probably not that good for the life-span. Thanks for the reminder. It did cross my mind in this case, but the red/green curves are so drastically different and un-mixed that I deemed context to be adequate for separation (e.g., a grayscale diagram would still be interpretable). But I’ll try to avoid this in the future. I guess this was better than having your flywheel or compressed air storage solution fail while you were out of town. You still had a house to return to! I hear you with the series and parallel problems, this reminds me of tire buying. That might make an interesting post. It sounds off-topic, but think of how much fuel is wasted from improperly maintained tires, and how much energy is wasted in buying tires too frequently. It’s been a while since I read this http://handybobsolar.wordpress.com/the-rv-battery-charging-puzzle-2/ but there was tons of battery-related info there, some of which may help? a pricey fix but doable is to switch to nickel-iron-lithium, that is to say improved edison batteries. there is a maker of such in the united states. that would be: http://www.zappworks.com for information and pricing. these batteries have some disadvantages but many more advantages and can and have lasted several decades with minimal maintenance. Hi Tom. A colleague and I looked hard at PV this year as we had an awesome deal on some panels but the batteries remain a dissappointment. Expensive and limited life for the outlay. If you are trying to build resilience for the years ahead having your storage pack up after 10 years, or 2.7 in your case, does not bode well. Have you considered something like Nickel-Iron batteries? They have awful energy density but seem to be indestructible and incredibly long lived. If you are only running light load from your PV setup could this be a solution. Not a lot of data out there on them, seem to be only made in China these days but available to buy (while oil stocks last, imagination not included). What about banking your 3 remaining batteries into a series bank with a voltage of 36 volts? Or will your inverter not accept that configuration? You guessed it: the inverter is a 24-V machine. A MPPT charge controller opens up the PV array configuration superbly, but once you buy an inverter, you tend to be stuck with a battery configuration commitment. Some small-scale inverters have a jumper selection for 12 or 24 volts, but the big ones I looked at when I bought mine were static. not knowing much about batteries, I am left to wonder why your parallel/series combination isn’t shorted across the middle? Wouldn’t that be a lot safer for the remaining batteries in case of a failure like this? And wouldn’t it generally be the preferred configuration in case of mismatched batteries, i.e. if you buy a new one now? Purchase 3 more batteries of the same make and model, and place each new battery in series with an old battery. Each of these separate circuits should be at the same voltage level with respect to each other, so the parallel problem shouldn’t be an issue – one pair of two won’t discharge into another pair because of differing voltages. True, the new/old combo inside each pair won’t be at the same voltage level with respect to one another, but the inverter won’t see that. There is a limitation : battery aging probably means that one or the other battery in the pair will not have the same effective maximum depth of discharge. This means that when trying to deeply discharge the bank, it will be “held back” by either the new or the old battery in each combination bottoming out first. This is probably not a practical issue. Up to my knowledge, batteries should not be connected in parallel. But in series is OK because the current is the same throu the batteries and that is what matters in terms of electrochemical reactions. Insteadof parallel connections, bigger A/h of batteries connected in series. My thoughts exactly… We run a hybrid grid-tied/emergency backup battery bank (48V). I’ve had nothing but trouble with smaller batteries, none of them have lasted even 2.7 years! I’ve only ever used batteries in series. http://damnthematrix.wordpress.com/2010/10/04/powering-up-for-the-collapse/ They still work just fine. I used to work for the chap who sold them to me, he’s been in the solar industry for over 33 years now. He told me he had a customer who also bought a used set of these batteries of the same age, and they lasted him 21 years…! So they were 31 yrs old when they were replaced, and they had still not yet died… but I have no idea whatsoever on how they were treated… they quite likely had a very easy life. I do have one issue I’m wondering about though….. your charging system seems to float your batteries at over 29V. That seems too high to me. In my system, that’s 58V (nearly 59V), and that’s “gassing” voltage, which you should not use in a sealed battery, and in an unsealed one only once a month maybe…. My batteries float at 54.4V, or 27.2V for your 24V setup…. Overcharging batteries regularly will shorten their lives just as much as undercharging. Worth thinking about. I have been told more than once to never place lead cell batteries directly onto a concrete floor as it accelerates voltage drain. Plywood is a commonly used platform. Perhaps one of the more knowledgeable writers above can explain to us why a battery’s hard plastic case is insufficient insulation when placed on concrete. This is old lore at this point. Was once true, I understand, but saw somewhere that this is no longer a concern. Probably easy to find details in search. Not sure about this Tom….. I was told to not put mine on concrete too. I know it’s not cold where you live (and it’s even warmer where I am) but concrete can keep batteries too cold through its thermal mass. But it does depend on your environment of course. It’s old lore that’s new truth for a completely different reason. I don’t want to mention the old lore part of it and add to the confusion but the new truth is this: The cold ground, concrete in your case, will cause a stratification of the electrolyte. The stratified electrolyte will cause the plates to operate differently from top to bottom and cause premature failure. In the very least you should get them up onto something insulating so the entire battery can operate at the same temperature from top to bottom. The process of “equalization” is supposed to reduce stratification by bringing the battery to the point of off-gassing and causing the electrolyte to “stir” but as soon as it stops, the ground is going to start to stratify it again. This is a classic example of an undersized battery bank attempting to drive a refrigerator 24/7. 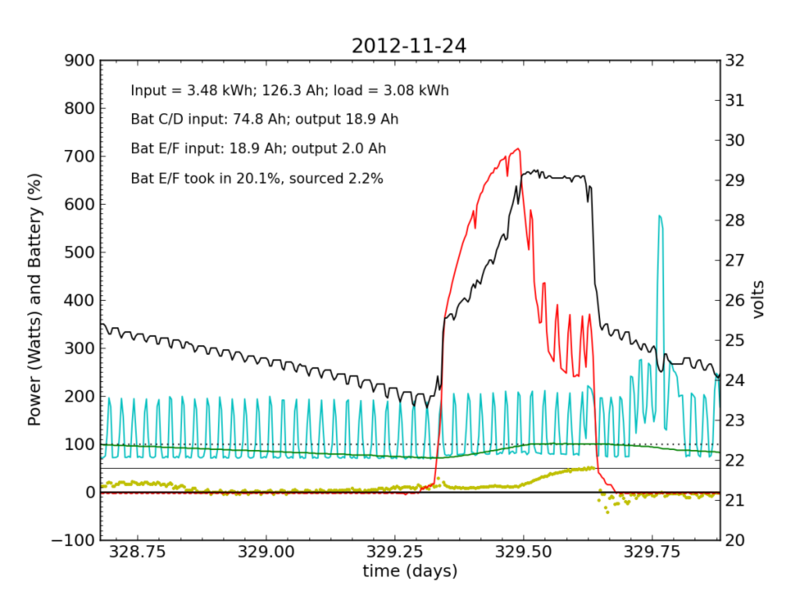 From the graphs shown, the batteries are typically discharged to 60-70% capacity. 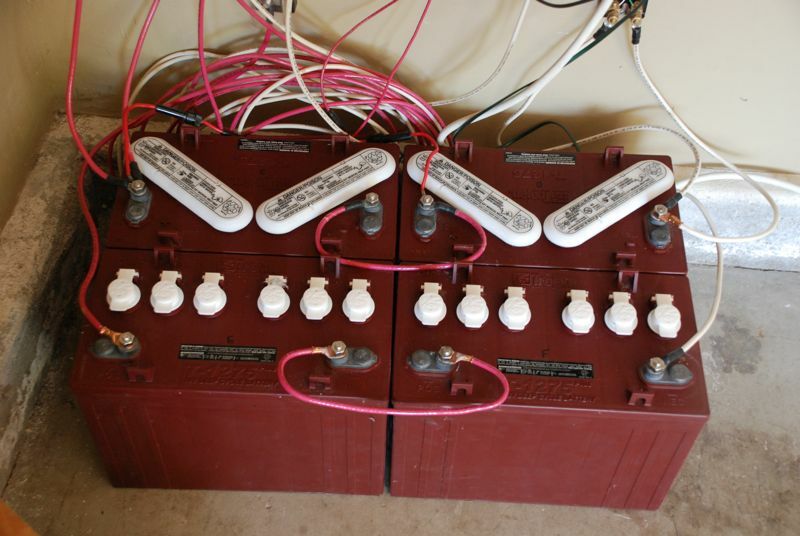 Damage occurs any time lead-acid batteries are discharged below 80%. The design of the battery bank is less than optimal. Instead of two parallel chains of 12v batteries, it would be better to have a single chain of 6v batteries. This topology can cope with bad cells far better than the series/parallel configuration. I would start over with 6 volt deep-cycle batteries rather than 12 volt golf cart batteries. You need more batteries/solar panels to avoid regular discharge below 80%. Switching to a single chain of 6 x 6 volt deep cycle batteries to make 36 volts should be sufficient. If you have series/parallel configuration for the solar array you may need to add diodes to each chain of solar panels to avoid current flowing from one chain into the next, which can kill a solar cell or module. 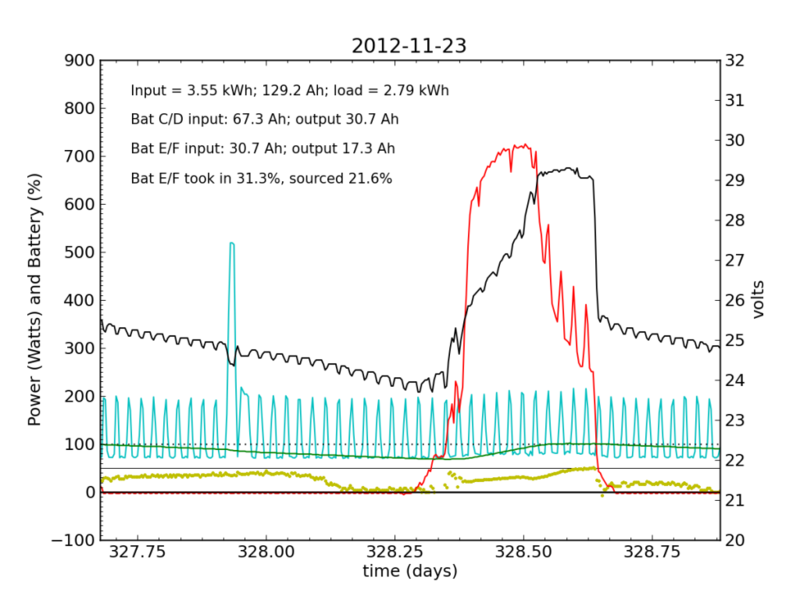 The solar array amperage graph indicates there might be oscillation occurring in the afternoon as the amps taper off. I would confirm if the oscillation is due to clouds or shadowing, otherwise you may have an issue with the solar array as well. A good reminder of the struggles that lay ahead of us… Not so coincidentally, PV panels will behave the same way as batteries if mismatched in series; a whole string can be reduced by one slacker on the end. The cells within the panel also relate, with the weakest, or shaded cell dragging the rest down and even potentially killing it’s brothers and sisters in series. Very tragic indeed. But on the topic of batteries, with a very quick google search I saw some references to remedies for desulfating with epsom salts, but this is likely not your issue. Have you looked at a similarly aged used battery for sale? It might be the best option for keeping the rest of your batteries going for their hopeful life. Best of luck. Let us know how it works out. Hi Tom, I love your writings and passion for collecting data. Commendable! Twenty years ago or so we were buying batteries for a traction application. The friendly battery salesman assured us that lead-acid batteries would be hopeless. He declared that if reliability were important to us, we’d have nothing to do with them. The available capacity from one cycle to the next could suddenly dive. You would send your vehicle out without being completely confident that the endurance would measure up to the previous run. They exhibit sudden death. And we found he was right. I also think you’ll find that the only users of lead-acid batteries reporting long service lives are those who do not actually discharge them. [So what use is a battery you don’t discharge?!] I’m thinking of telephone system applications where a bank of flooded cells in an air-conditioned room sits waiting for a mains power failure, whereupon they automatically maintain the exchange’s DC bus voltage. In this application they are there as an insurance policy and may only experience a handful of discharge hours per year. Or even none at all. Lead-acid cells don’t like being discharged. They only persist in the market because they are cheap(ish) compared with alternatives. They are a good solution for engine cranking which needs high current but only low depth of discharge. Some of the comments above are right on target. Using 4 6v batteries in series will solve your series/parallel mismatch problems. The parallel matching problem was probably exacerbated by the small gage wires used for the connections. I would use a minimum 1/0 cable for the battery connections. For moderately priced quality battery I suggest the Rolls S600. Four in series will give you a 450AH 24v bank. My wires are indeed smaller than many you will see in similar applications. But I run a pretty wimpy system, never drawing more than about 800 W from the system, translating to about 30 amps. Limiting the depth of discharge which in your situation can be done with a low voltage shut off. Avoiding over charging which is what it sounds like you are doing with your equalizing process. If you are doing high voltage charging with the idea of equalizing then that is hard on your battery (creates heat, and gas discharge that can explode). It works once in a while but a better option is to charge each battery seperately with an actual battery charger not just a converter. Doing that with a pulse generating charger would help to desulfate the batteries and that really does extent the life. I have had good luck with the Extreme charger on this level. Putting each battery on one of these for 24 hours or longer periodically will desulfate and bring all the cells to very close to the same charge. Isolating your two battery packs is a really good idea. The parallel bank concern increases with the age of the batteries. There are devices for doing that. I believe they are called battery isolators and are used in marine applications. If you isolate the two banks you can replace one bank with fresh batteries. The good battery from the failed bank can be rotated into the old bank to extent the life of that bank as long as the one on standby is put on a float charger to keep it from killing itself. USe the desulfater for that and all three should live long and productive lives. Such a charger may be able to reclaim your bad battery but not very likely as it has clearly lost one cell that is probably shorted. YOu could use an old battery with a fresh one for a short time if needed but the old one has a higher resistance and that will create problems in the fresh one over time. The fresh one would get a higher charge than the old one and that ages the newer one more quickly. That problem gets really big if another cell shorts in an old battery. Lead acid batteries benefit from a tapered charge when at 80% SOC. If your converter is not doing that then you are getting destructive heat. THe concrete floor issue can create a temperature differential inside your battery. The cold bottom can increase a tendency for the acid seperation. A piece of wood is a pretty cheap safeguard. The thick ness of the wires seems like a strange factor in this mix. If there is heat loss then that is a reason to deal with it. No heat, no worries or am I missing something? The only reason I see to switch to 6 volt is to avoid having to isolate the two banks. That looses the benefit of the redundancy which has kept you going when one of 4 batteries failed. If one 6 volt fails you have lost you whole pack. There’s one thing I wanted to ask about in response to your earlier battery-system post (Blow-by-blow), but didn’t have ready in time. Now is probably as on-topic as it will get before the next open post. You mentioned that incoming solar power often goes unused because the batteries are full, and this is pretty much unavoidable because you want to give the batteries lots of 100%-full time for their health. I was thinking, usually energy-doomers like yourself laugh at the “hydrogen-economy” dreamers for valid reasons. But while electrolyzing water using grid power or with power that could be pushed into the grid isn’t normally wise, if the energy is just going to waste, then maybe low efficiency on the round trip doesn’t matter. So you’d have two energy reserves, a “chequeing account” of coddled batteries with high round-trip efficiency, and a “savings account” of synthesized fuel with low round-trip efficiency but fewer restrictions. Hydrogen isn’t as easy to store as other forms of chemical energy, but the more useful things you can make with electrolysis (aluminum and alkali metals) require extreme temperatures and are thus obviously infeasible. If only there was a home-scale way to make electricity into something liquid…. Do you think this is scalable down to a personal storage system, or would it have to remain big scale? There is also the efficiency problem; I read that the conversion is only about 15% efficiency. The utility of the liquid fuel produced (i.e. its good energy storage properties) has to counteract the wastefulness of producing it. But 15% efficiency would be a great improvement over the 0% efficiency Murphy now gets when the sun is shining while his lead batteries are full. Sure, using a two-way electricity-fuel conversion process (such as a hydrogen fuel cell and water-electrolysis rig) /alone/ would be a step backward from lead-acid for the foreseeable future. But as a supplement it has promise. Note that such a supplemental fuel synthesis system could still be useful even only including the electricity-to-fuel component. If lead batteries are enough to keep the computers running and the fridge cold, then the fuel can be treated not as part of the energy reserve, but a salable byproduct of the system. The key advantage of fuel synthesis as storage is scalability; once you have the conversion equipment, additional storage capacity is simple another metal tank to hold the liquid you have produced. That said, it still seems like a complex industrial process rather than a back garden amateur thing. It’s not just the infinite scalability, but the fact that the structure of an empty jerrycan will last much longer than the contents of a full one. If Murphy simply had more or bigger batteries (without even approaching the limits of what he could fit in his house), he could avoid ever letting sunlight go to waste. But then his batteries would never be entirely full, which apparently is not good for their longevity. We’re running out of time before commenting on this post closes. So I’d just like to ask that Murphy re-evaluate “Got Storage” on the assumption we’d be adding an alternative system that is only to be “charged” when the front line batteries are full. This system is permitted to have much lower round-trip energy efficiency than batteries, but more density is demanded in return. I don’t know too much about the subject, but I am surprised that you don’t have any system to control the loading and unloading of the batteries. It should be easy to built a system with a transistor making sure that the amps are going the right way depending of the voltage of the batteries and of the solar panels. This would allow you to have as many batteries in parallel as you want. I think you’re describing the role of the charge controller. I think he means effectively isolating each string. This is important/essential if there are more than 4 strings in parallel (which should be considered the absolute maximum in most situations). One way of acheiving this is to use two steering diodes on each bank. For example, one diode is connected to the load (anode to the battery positive) and the second is connected to the chanrge controller (cathode to the battery positive). There are some issues with this notable voltage (and hence energy) loss through the diodes, getting diodes that can handle the currents in use and potential stability problems with the charge controller. normally on smaller systems these are not issues. On bigger systems the use of relays and/or solid state switching (eg mosfets) is usually preferred. I was thinking at a diode type of solution, but if you just have a diode, you still have the issue of having one of the strings out of order or simply older. With a transistor or thyristor type of device, you could for example forbid any loading of the batteries when there is no PV production, or disconnect the batteries that are empty and keep going with the one that are still loaded, or limit the amps going in or out of the batteries. It also works with relays, but it might be more complicated to implement. If you really want an example of sudden and catastrophic battery failure, then look at how a car battery fails. In almost all cases the car starts in the morning and then the battery fails completely that evening (or vice-versa). No warning, no hint. In your case there was some warning, a few days at least, but it still seems quite sudden compared to most deep cycle battery failures which fail reasonably gracefully. It’s all to do with the mechanical structure of the electrodes. Good quality deep cycle batteries have a lower surface area to volume ratio which helps reduced sudden plate failure especially under heavy discharge regimes. However, this comes at the expense of current delivery capacity so they’re not great for suppplying cranking amps for a car, truck etc. Excessive depth of discharge, undercharging and overcharging all cause significant reduction in battery life. Given that batteries are usually the biggest expense in a typical system it makes sense to use a good quality charge controller and inverters and load controllers with low-voltage cutouts to protect the batteries. If you stick with AGM or Gel cell construction then you don’t have to worry about a lot of the usual maintenance routines including topping up, equalising (the gassing of which also ensures that the flooded electrolyte is stirred up preventing sulphation), etc. However they can be more expensive. In a stationary situation, if you want to go with flooded cells then purchase true deep cycle batteries with really “meaty” electrodes. You also have to be prepared to do regular maintenance. The whole series parallel discussion can quickly degenerate into farce as opinions abound and hard data is sometimes difficult to come by. There are any number of “Rules of Thumb” about best practice etc. but the key when connecting any number of batteries together (esp. in parallel) is to monitor the battery bank closely, which you are already doing, and use large cables to interconnect the batteries. Even with low resistance connections there will be variations in current between strings. If you want to go even further (although it is overkill because battery internal resistance will partially compensate) change you connections to the load and the charger, so that the connection occurs at battery “C” and battery “F”. This will minimise any variation. You could also consider some enhancements such as alarms when certain conditions are met (eg current flowing in different directions in each string). In this respect, what do you think of Donald Sadoway LMB (Liquid Metal Battery) of TED talk fame? Could it be a solution that will make a difference and scale up to grid requirements? I certainly agree that batteries are likely to disappoint. At the same time, they are better than nothing and often the best option available to us, allowing us to do things that otherwise may not be possible at all. So I have a sort-of love/hate relationship with them. Can’t live with them, can’t live without them. A friend pointed me to the Sadoway TED talk a couple weeks back. Once you get past the populist appeals and self-comparisons to Volta, Mendeleev, etc., I thought the talk was interesting although bereft of the kinds of numbers that would make me feel better about the technology–like comparative performance to the “expert” batteries of sodium-sulfur, lead-acid, etc. The numbers that *were* present didn’t light me up: the 16-inch “pizza” cell stores 1 kWh. My lead-acid batteries store 1.5 kWh each and are more compact. It would be hard for me to imagine that the cell and associated controls could compete with the $200 price tag of the lead-acid cell. And it seemed that if you’re going to make a shipping-container-sized battery, why populate with lots of trays of individual units, each with a lot of material in the metal casing, inefficient use of space, etc.? Why not make a giant cell? Hard to believe it would actually fly. But all this with the caveat that I have seen nothing more on it other than a TED talk. By the way, I can totally relate to your love/hate relationship. As a CS phd student living a life constantly on the move, I’m both amazed by the battery performance of modern laptops compared to their ancestors and still perpetually upset at their neverending problems. I pretty much understand what you’re saying: we already have a 1kWh performance for a reasonably cheap price in a lighter pack. But then, I simply don’t understand what is the proposed advancement. The LMB idea is already a startup that managed to get substantial funds (http://www.ambri.com/investors/). Lots of startups do, I know, but they should at least promise something. What? Is it scaling? Could such a battery be mass produced up to nation size? It is difficult for me to understand, but a quick look at wikipedia shows that magnesium is indeed *extremely* abundant, but antimony isn’t. At least: from what I understand, we have two orders of magnitude more antimony than lead (good news? ), but we already use a lot more of it, and this makes the current rates of depletion of known reserves of the two elements not a lot different (according to wikipedia at least). This doesn’t sound so good anymore. How was the failed battery after the last equalization? Why equalize the hell out of the failed battery? It’s already dead and you MIGHT be able to resurrect it. See the picture of all four batteries. Why not move the connection from the positive post of C to the positive post of E and vice versa. This will more evenly load/charge both pairs of batteries. I’m making some assumptions about the wiring, but the thought is valid even if my assumptions not. Looks like your charging rates are kinda high….C/2 to C/3…? I thought C/5 to C/10 was ideal for battery life. 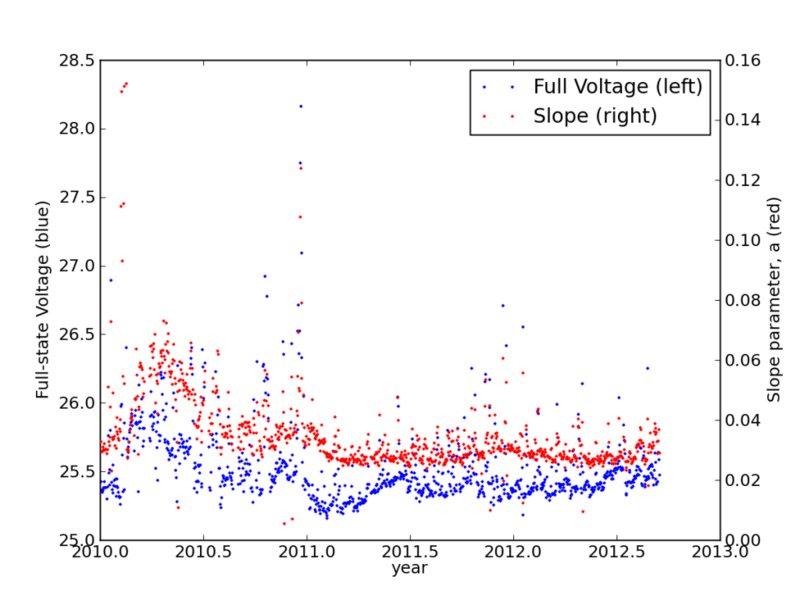 I feel your pain, my ‘hobby’ PV system just lost its only battery last week (40 Ah), also after 2.5 years. Let’s see. At most, I throw about 900 W into the batteries, which comes to about 33 A (into 27 volt charging batt), split between the parallel tracks for about 15 A each. At a rated 150 Ah, this makes for C/10. Am I mistaken? What numbers are you looking at? We have a 48V battery bank using Deka brand AGM batteries. (4) 100AH batteries in series. The first set of batteries many years ago had a problem like you describe. One battery went out to lunch after 1 year of use and never came back. I spoke with Deka batteries and they said that after 1 year I could replace the battery with a new one and that was OK After 1 year it gets more risky. I don’t like lead acid batteries. They are not reliable. And the flooded ones, I believe, are the worst of the bunch. The AGM and gel types seem to last longer. When 1 cell in a flooded battery shorts out (seems to match the description of your problem), you can’t really ever get it back working. My advice is to buy 1 new battery and see how it goes. When another one fails buy either the big batteries like other posters have mentioned or use AGM. That a “slight wrong doing” in any charging or setup procedure shouldn’t cause such a catastrophic failure. It “must” be a mechanical weakness from day 1, such as a separator in a plate coming loose, which was “waiting” to fail after a certain amount of chemical, electrical (or even temp differences?) stressing caused it to break. That company must owe you!